So, I downloaded the Cosmetifique app for the iPhone about a month ago and am back to share my thoughts on it. Firstly, it looks and feels kinda clunky. It takes a large amount of effort to manually enter all the ingredients from a product ingredient list into the app and out of the 7 different products I tried, Cosmetifique’s database was missing at least 2 ingredients from each product, so after all that effort, I didn’t feel like I was getting the full picture anyway. I was actually expecting to be able to simply enter the name and brand of the cosmetic item and watch as the app downloaded all the relevant INCI (International Nomenclature of Cosmetic Ingredients) info from it’s own database. I didn’t realise I had to manually enter each ingredient into the app myself. What a palaver! The app is designed to be used whilst shopping, so that you can input ingredients into the program and in a matter of seconds discover the quality of the INCI rating. This sounds promising, but the app uses a hugely simplified traffic light system to rate the quality of the ingredients where RED = BAD, GREEN = GOOD and YELLOW & AMBER = somewhere inbetween the two. This over simplification doesn’t appeal to me, I want to know *why* Limonene is a YELLOW, even just a small paragraph would do. 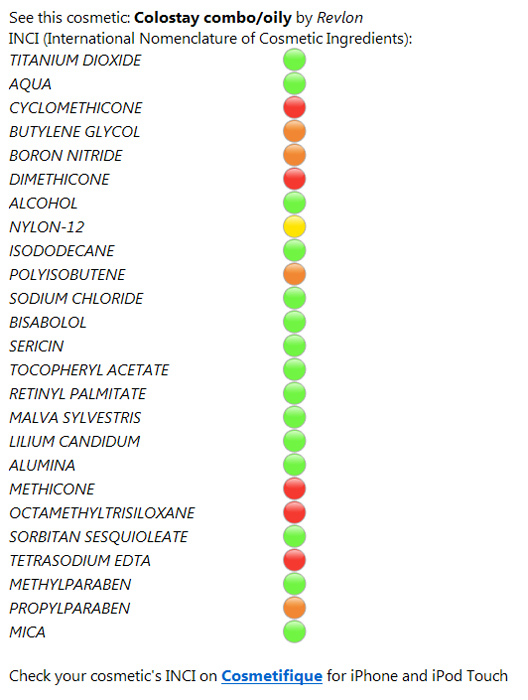 I also compared the results from Cosmetifique to Cosmetics Database and got conflicting results on some ingredients, which confused me further. Quality of Ingredients: So so… be careful. So So? That’s useful, thanks. What am I being careful of? Skin Irritation? Tentative links to cancer? Not blending my jawline adequately? I just don’t really ‘get’ anything from this app and the sketchy knowledge it provides me, it doesn’t give me enough information to make any informed choices and the lmited information that it does display on my screen is often incomplete anyway. What’s the point. It would be so much better if it was a database, but then I suppose cosmetics companies don’t want us deciding something is ‘bad’ for us and never buying it again! You have to enter everything yourself manually? You could just google it. Thanks for the review. Sounds like a waste of $! LOL @ the last sentence! @SilhouetteScreams – It really is. boo! @Laura – I think it’s also a case of a little knowledge is… well, not really enough to do anything with! @beeks – hey, haven’t seen you around for a bit. Nice timing, gonna go catch up on your blog, only problem is I always get lost in it. It’s like a black hole and I lose track of time and don’t get anything done. Perfect! Haha I lol’d at that last sentence too! I agree that this app is pointless if it doesn’t tell you why the ingredients are “bad”.